lps has a unique product offering in the home textiles space. We wanted to remain in the mainstream home textiles product with a bit of difference in terms of what we offer to the market. Our advent in cotton and cotton blends upholstery has paid good dividend. Alps history as a cotton spinner helps the cause in understanding the cotton fabric better. Cotton still remains to be a preferred choice of a lot of home decorator for comfort and rustic look in the house. Window blinds are the latest & smart way to deck up any window. There are varieties of blinds like Roller Blinds, Vertical Blinds, Venetian Blinds, Woven Blinds, Bamboo Blinds, Roll Up and Roman Blinds etc... Our Roller & roman shades are famous in the market for the style, innovative designs and the options that make it suitable for almost any decor. We use premium quality of Fabric and components to manufacture the safest & Stylish window blinds. Blinds offered by us adds suave look to any window and are amongst the most popular blinds in the market. Vista Window Blinds can be motorized, operated either by switch or remote control, depending upon the requirement. We offer you the finest motorized options with the facility to operate single blind from single remote or multiple blind from single remote. 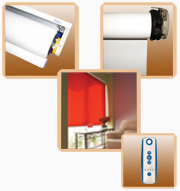 Venetian, Roller & Roman Blinds today can be motorized & remote controlled. All types of retractable awning (folding arm and drop arm) can be best utilized when motorized. To give new dimension to your interiors, we offer best ranges of laminate wooden flooring and solid hardwood flooring. 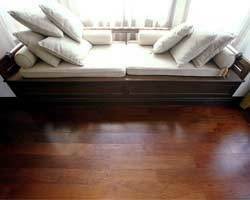 Wooden flooring gives an allowing look to your interior.